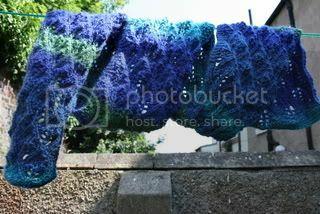 Fizz Knits: It's the middle of summer so - Time for scarves! Still using up my stash so no better way then knitting scarves! When I got in the car today the temperature indicator said 35 degrees but it had been sitting in the sun. As we moved off it dropped down to 23 degrees but that's still very hot for here. 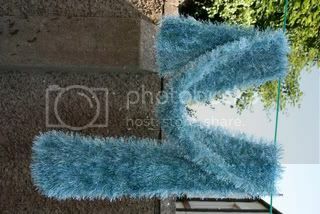 So I feel a bit daft knitting scarves but hey, I'll get ahead of myself for Christmas! This is knitted in cheapo eyelash yarn, which I picked up for £1 a ball in a bookshop last year. I cast on 24 stitches and garter stitched until I ran out of yarn (it took 2 balls). This is the Lace Leaf Scarf from Knit Simple magazine holiday 2006 issue. 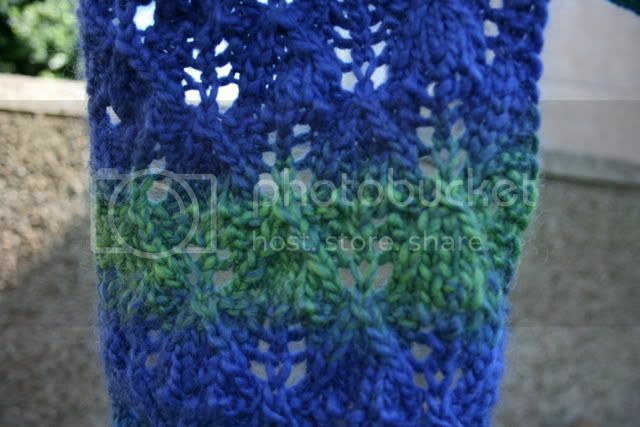 It's still to be blocked so the lace pattern isn't too clear in the picture. It's knit in 3 balls of Wendy Fusion. 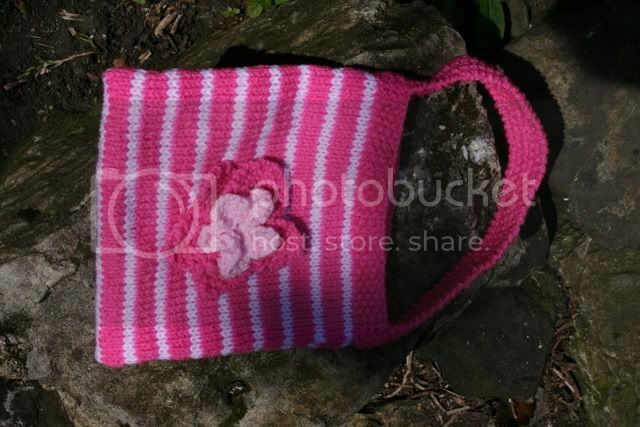 This is a wee bag I made for my friends daughters 5th birthday. It is from issue 10 of Knit Today magazine, though the pattern has an ice cream cone motif sewn on the front. I knitted the flowers from the free Nicky Epstein flower booklet that came with issue 9. I also have pics somewhere of my most recent Secret Santa Swap parcel however have not quite worked out how to get them on here. I use Photobucket usually but for the swap we had to post them to flickr and haven't had a proper nose around it yet to work out how to get my pics on here. I am impressed by your organisation! I've started *thinking* about Christmas knits, but that's as far as I've got! As for the photos, you can also upload them to Photobucket if they're still on your pc. :-) I think you can upload to Blogger directly from your computer, too.